Note 1: Shipping charge varies and billed separately - 71.21 kg - 157 lbs. Universal, secure solution to charge, store, and transport up to 30 devices. 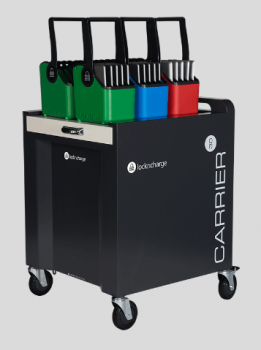 It’s an ‘everything cart’ – Chromebook Cart, Tablet Cart, Laptop Cart, iPad Cart. 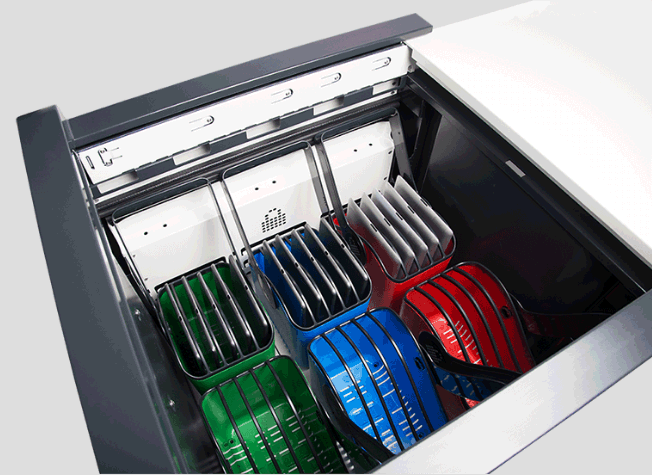 The new Carrier 30 Cart features an improved soft closing top lid that can double as a work surface, while being lighter and easier to maneuver. With the cable management moved to the sides, included Baskets by LocknCharge are even easier to remove without catching cables. A programmable padlock means no keys to lose or worry about. An external display allows you to see the charging status of your devices without having to unlock the cart. Weight (Approximate): 71.21 kg - 157 lbs.